Personally, I’m partial to gin, with its cool, refreshing crispness and its evocation of those happily irreverent flappers. More importantly, it’s possible for me to drink copious amounts of gin and still be nice to people (the same is sadly not true of bourbon). Gin is really quite lovely on a hot, sunny afternoon and, as it turns out, it blends beautifully with the tangy tartness of rhubarb. So beautifully that you barely notice the gin and may therefore find yourself frowning into your glass and erroneously declaring to the world at large that “this could use a lil’ more gin,” in which case you’re liable to end up knee-walking drunk in the middle of the afternoon. Which, if you’ve had a week from hell, might not be such a bad thing. Alternatively, you could be a good girl and just drink one. Okay, two. 1) Bring rhubarb, sugar, and water to a boil in a large pot. Stir until sugar dissolves, then reduce the heat to low and simmer, partially covered, until the rhubarb falls apart, about 15 minutes. 2) Remove from the heat and cool for about 15 minutes. Pour the mixture through a fine-mesh sieve set over a large bowl and drain for 15 minutes, then press gently on and discard solids. 4) Stir in the lime juice, gin and Cointreau. 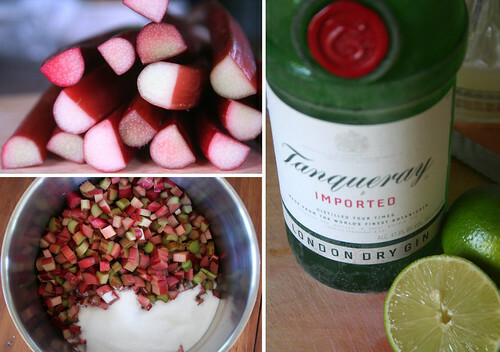 5) Fill glasses with ice and add the rhubarb-gin mixture, stopping about 1 inch from the rim of the glass. Top off with club soda. 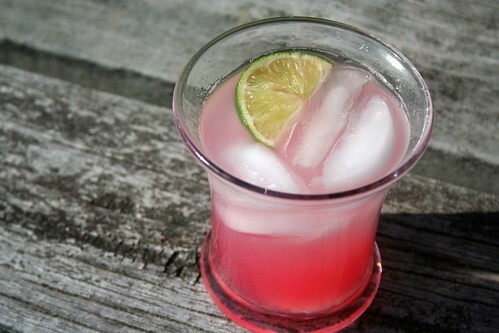 Run a wedge of lime around the rim of each glass, then squeeze lime into the drink. This entry was posted on June 14, 2009 by Megan @ When Harry Met Salad. It was filed under cocktails, fruits & vegetables and was tagged with cocktail, rhubarb, spring. That does it, I’m planting rhubarb. That’s the only pink and green accessory you’ll ever see in my presence! Reeks of Summer Solstice; I love it! 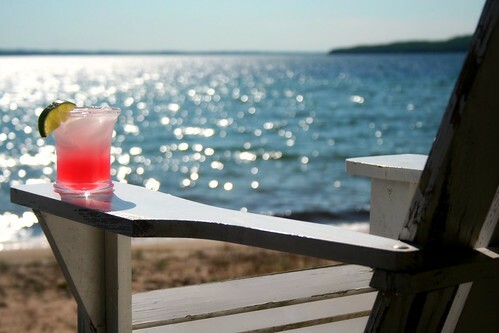 Looks delicious and refreshing! Just found your blog. You have a lot of nice recipes here! Ok number one love all the rhubarb ideas. Number two bitter about the cocktail. Next summer I guess! I never really realized that this is not a southern item. Rob and I want to make a strawberry rhubarb pie, but whenever we do it is all runny. Are we supposed to cook the filling down first? A pie can only have so much corn starch! The cake is yummy! Hope all is well! House is coming along now that rob has some deadlines! Your next visit you will have to come see the progress! If it is a Christmas visit you will have to come see the house and the new baby…that was a scary line to add in there!!!! Do you get Sunset? There was recipe a couple of months ago for basil gimlets. 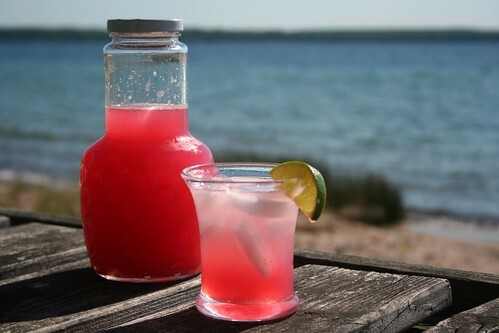 Just infuse a simple syrup with basil and use that and some fresh lime in place of Rose’s lime. Make the gimlet as usual. I made them and yum! The syrup doesn’t keep long, tho. The next weekend I tried to make the drink again with the syrup from the previous weekend, and refreshing basil gimlet had become weird pesto gimlet. Kirby & Zoomie — You know, I need to plant some rhubarb too. Mine is imported from local farmers. But really, that stuff grows like crazy. . .might as well grow your own. Katie – I was totally with you on the pink and green thing until I got dressed the other day and lo, pink + green. But not in a vomit-inducing Lily Pulitzer kind of way. Kim – Thank you and welcome! Jess – Hey, that’s what happens when you get yourself knocked up: no hooch for you. As for the pie, how large are your vents? Betcha you need more. Try a lattice top. Or cut out some (large) decorative shapes to let all the steam out. Next visit is October, I think. Although I still entertain thoughts of actually making it back this summer. I miss the ocean. Vikki – That sounds pretty yummy. I got a few trial issues of Sunset and liked it well enough, but my trial issues came during the winter and it made me sad to see things like gardens and basil gimlets and sunshine while I was busy shoveling two feet of snow off the driveway every day. *shudder* Let us not think of such things during the happy months.